Acclaimed singer musician Judith Berkson presents arrangements of music from the YIVO sound archives, including from unreleased and rare recordings from Eastern European cantorial singing from the “Golden Age” of Cantors. Berkson, Frank London, Lana Cencic, and Cleek Schrey, reinterpret the sounds of Chagy, Karniol and Sophie Kurtzer. Berkson has composed new music inspired by the YIVO sound collection. The Leib Glantz Project Team announces that the website of the LEIB GLANTZ PROJECT is now up and running on the Florida Atlantic University website. This following last year’s publication of the 500-page book THE LEIB GLANTZ PROJECT that included three audio compact disks. The website is defined as “Sound ‘n Scores” – a project of the Recorded Sound Archives at Florida Atlantic University Libraries in Boca Raton. It is a unique online approach to music studies, which combines the experience of hearing recorded sound tracks while viewing corresponding sheet music. The website contains 43 Leib Glantz compositions, organized into seven content areas in the order they are performed in Jewish prayer services. Anshe Emet’s annual Kaplan Concert will honor Hazzan Alberto Mizrahi and his 25 years of service to the synagogue. The concert will include performances from world famous Hazzanim who will be in Chicago for the annual Cantors Assembly. 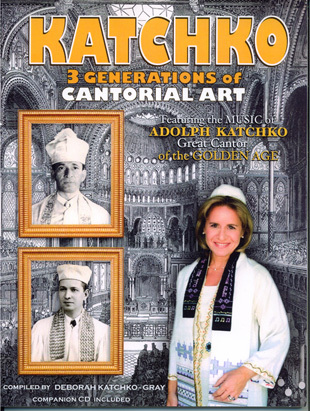 One of my goals as incoming President of the Cantors Assembly is to find ways to meld the traditional modes and magnificent music of our past with more contemporary melodies and musical interpretations. Congregation Rodeph Sholom’s Senior Cantor, Rebecca Garfein, Associate Cantor, Shayna De Lowe and Cantorial Intern, Ben Ellerin will commemorate the 75th Anniversary of Kristallnacht-“the Night of Broken Glass”, with the rarely performed and glorious music of renowned Viennese Cantor, Salomon Sulzer and Berlin composer, Louis Lewandowski at 6p.m., Friday, November 8, 2013 during Shabbat services. Also featured will be the newly commissioned song-cycle, “Perhaps a Butterfly,” composed by Eliot Bailen in memory of Cantor Garfein’s great-grandmother, Settchen Feist who after being sent to Theresienstadt, subsequently perished in Auschwitz. The song-cycle utilizes four poems written by children of Theresienstadt. The European Cantors Association is delighted to announce the next European Cantors Convention. It will take place in London, at Central Synagogue, from Monday 17 to Thursday 20 June 2013, followed by a Shabbaton 21/22 June. The convention will open with a concert on Monday 17 June. The Guest cantors will be the incredible composer, practitioner and educator Sol Zim from New York, and the outstanding teacher / practitioner who proved so excellent and popular last year Yehezkel Klang from Israel. A concert honoring a rich tradition of cantorial masterpieces capturing their fundamental duality: joy and despair, longing and redemption, the deeply haunting and the wildly celebratory. or call (212) 219-0888, ext. 205. Tickets are $20 for adults, $15 for students and seniors. A limited number of VIP premier seats are available for $100. Jewish music has been in the concert halls for a while. Many tapes are finding their way to YouTube. Example here is: Mi Sheberach, 12th Annual Cantorial Concert, West Palm Beach, FL 1997, for Cantor, Chorus and Orchestra. Wine and cheese reception to follow the concert, hosted by Temple Gates of Prayer. Please come out and support the next generation of Hazzanim and other lovers of Jewish music. Complimentary valet parking is available in the synagogue parking lot. Temple Gates of Prayer in Flushing NY is 20 minutes from Manhattan by car, about 4 miles from the Whitestone Bridge and 10-15 minutes from the Triboro. Event: Jerusalem Institute for Chazzanut sings Kabbalos Shabbas – Modjitz! (Where we can hear another superb arrangement by Goldstein). The Cantorial Association in France has a website that tells about their organization, including listening clips from their various recordings, both CD and DVD, a photo gallery of activities and concerts, listings of concerts with posters, and biographical listings of various cantors. congregation, and explain that the DNA for hazzanut is contained therein. 100 Voices: A Journey Home Encore Screenings November 11 Jewish and Polish cultures, once interwoven for centuries, reunite for an unprecedented and poignant event of remembrance, healing, resilience and rebirth in 100 Voices: A Journey Home. A website, Chazzunes has gathered numerous YouTube videos of various cantors from historical images as well as the current day and listed them alphabetically by the name of the hazzan. It also has links and ads for events and recordings of cantors and you can follow entries on twitter or facebook. Chazzunes for the modern age. Sunday March 1, 2009 @ 1 p.m. The Fourth Annual Cantorial Concert is being held in Ocala, Florida. Silver Springs Blvd. in Ocala. Temple Beth Shalom, will highlight 60 years of Israel’s musical gems. Temple Emanuel, 385 Ward St., Newton, MA. Jacobson of New York is now available. Sal Kluger can get you a copy for $39.00 . recently added audio of the weekday davening and the Passover Seder as well. Katzen-Guthrie, Chana Olmstead, Steve Berman and Dale Berman. Tickets are $20 and may be purchased by calling Gary Green 352.347-2481. “tenor” patron $150, 2 tickets; “baritone” sponsor” $75, 1 ticket. Sunday, December 3, 2006 at 7:30pm. Acclaimed Cantor Yizchak Meir Helfgot will sing cantorial classics at the Metropolitcan Opera House in New York as part of a Cantors World presentation. Cantor Helfgot is cantor at the Park East Synagogue. He will be accompanied by members of the New York Philharmonic with Dr. M. Sobol conducting a choir. General seating is $50, VIP $100, Friend $180, Family $250 and Supporter $500. There are other seatings as well. For more information see www.cantorsworld.com or call 718-851-3226. Lewandowski at 6p.m., Friday, November 3, 2006 during Shabbat services. also participate in this special service. Rodeph Sholom’s Organist, Dr.
Central Park West.) For more information, please call (212) 362-8800, extension 1337.
will be our honoured guests. Please read more! 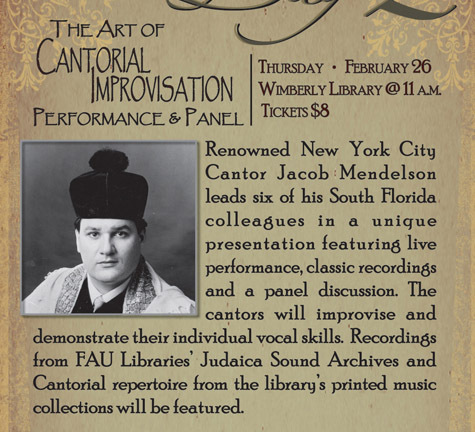 In association with the American Society for the Advancement of Cantorial Arts. Inc. This is a tsedakah concert. We’ve just received the library issue of The Journal of Synagogue Music, published by the Cantor’s Assembly and it looks like a particularly special issue: Vol. 30, No. 1, for Fall, 2005. There are theoretical articles by Samuel Rosenbaum, Max Wohlberg (excerpt from a talk from 1980), Geoffrey Goldberg, Akiva Zimmermann, Benjie Ellen Schiller and Boaz Tarsi, … and that’s just the first section. Better get your copy. A Festival of Choirs is free of charge and open to the entire community. concert, please call (212) 362-8800, ext. 1337. September 21 at 7:30pm in Merkin Hall at 129 West 67th Street, New York City, a pre-high holiday special concert featuring Cantor Sol Zim, Cantor Jeffrey Nadel and Cantor Ari Klein. Also featuring Cantor Eliyahu Greenblatt, Azi Schwartz and his choir, Cantor Yechezkel Klang, and Cantor Daniel Gildar. The price is $40 general admission. For reservations call: 718-851-3226 or go to www.CantorsWorld.com for more information. Cantorial Council of America is having a concert commemorating the 72nd Yahrtzeit of the legendary Chazzan Yossele Rosenblatt, June 22, 2005 at 7:30pm at the Riverdale Jewish Center. 3700 Independence Avenue, Riverdale, NY 10463. Phone 718-548-1850 Tickets are $36. It will feature singing by Cantor Joseph Malovany, Cantor Shimon Craimer, Cantor Netanel Herstik, Cantor Benjamin Muller, Cantor Joseph Muller with Yitzchak Muller. Cantor Daniel Gildar, Accompanist. Call for more information. with Yitchok Helfgott, Moshe Stern, Moshe Haschel and Matthew Lazar & Choir..
$36 general admission. $100 Patron (preferred seating and CD). Temple Beth Shalom of Ocala presents A Cantorial Concert to be held Sunday, May 15, 2005 at 4:00 PM at the Appleton Museum of Art, 4333 NE Silver Springs Boulevard, Ocala. The concert is a unique opportunity to hear wonderful Jewish melodies sung by a diverse and exciting group of Cantors and Soloists. You will hear an afternoon of Jewish song, featuring Temple Beth Shalom’s Rabbi/Cantor Samuel Dov Berman, his brother Steve Berman who sings in the Master Chorale of LA and some of Tampa Bay area’s finest voices. You will be delighted to hear some familiar Broadway favorites as well as Jewish cultural and sacred selections. W.G.S. Bornstein, Chazzones aan het Nederlands Israelitisch Seminarium, de historie van de Hollandse Cantoropleiding (Stichting Eliezer: Amsterdam 5765 / 2004), 38 pages. Those that love cantorial music, check out the Rozhinke website. Here are a group of people busy preserving cantorial music, not only for today, but for the future when it will become popular again. These dedicated cantors meet, retreat, and sing! There are workshops and singing, and nightly concerts. It’s a type of music camp, August 10-13, for cantors and for those that love the music… it very intriguing, exciting and looks like there’s lots to do and hear. Anyone can attend. Sulzer, Lewandowski, Kirschner, and Kellerman. 7630 N. SANTA MONICA BL. Free and Open to the Public. All are invited.